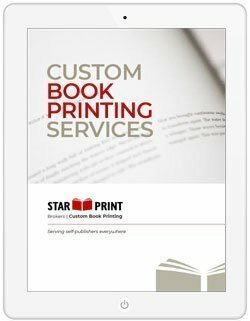 Discover the many Book Printing and Related Services of Star Print Brokers. Our services are many and we have a lot to offer self-publishers. Download the free handbook to learn more about the things we offer. We have many posts and pages in our site that cover a variety of subjects related to our book printing services including book design. Download the Free Services Handbook. It’s free, and we don’t even ask you to provide an email address. But, we would love to hear from you, or send you 2 to 3 informative email newsletters a month. Better yet, fill out our request for quote form to get a quote! See the handbook table of contents that follows. In addition to downloading the handbook, you can use the links below to visit many of our website pages and posts. About Us – A bit about our team. Star Print Brokers, since 1999. Hardcover Options – also see hardcover bindings. Soft Cover Options – check out soft cover bindings too. Book Printing Asia – Cost less, and the quality is higher — with the printers we use. It not the country. It’s the printer. Book Printing USA – Good for soft cover books with quick turnaround. Costs more. Book Design USA – We can design or work with you or your designer. Bindings – Hardcover, soft cover, Wire-O, board books, and more. Proofs – 1 set of full color proofs is included in Asia quote. Advance Copies – 5 advance copies from the production run. Delivery – Included in quote, unless otherwise stated. Ebooks – We do fixed-layout ebooks, when you need images and text to stay together, not to flow. Extras – See our individual options on the large navigation menu. If you don’t see what you want, please ask us. Distribution – Print with us for the best quality. Place title on Amazon for the most traffic. How We Work – A quick read about how it works. Contact – Call, email, or snail mail. Follow link for all! How much better can your book be? Find out at Star Print Brokers!